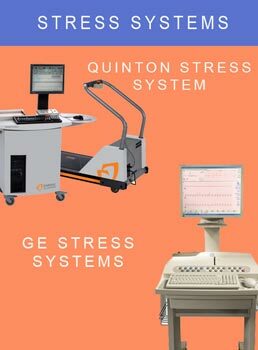 Buying a Q-4000 Stress Test Systems from a reputable American International Medical dealer offers substantial savings over buying new. 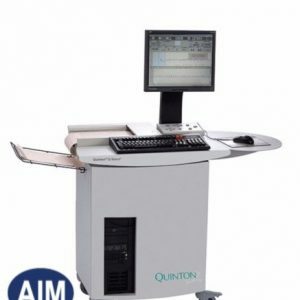 Description: Records three 50 mm-wide ECG channels and a 45 mm-wide half channel containing alphanumeric data for labeling and calculated parameters. Writing Method: High-resolution thermal printhead. Speeds: 2, 25, and 50 mm/sec. Paper Capacity: 200 feet (61 meter) of Z-fold paper. Paper size: 8 ½” x 11″ (216 x 280 mm). Paper Type: Thermal paper, Z-fold. Calculated parameters: heart rate, ST level, and ST slope. Fiducial point for ST measurement: j-junction (calculated using QRS offset and isoelectric reference point). Descriptions: 14-wire, low-noise, shielded cable for developing the 12 standard leads and the XYZ Frank leads. Color coded connectors comply with the 1975 AHA recommendations. 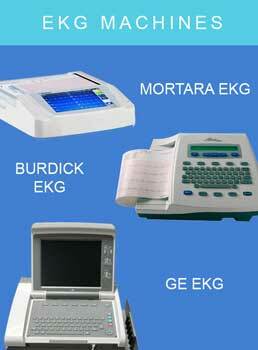 Outputs are simulated ECG signals for the 14 electrode sites. 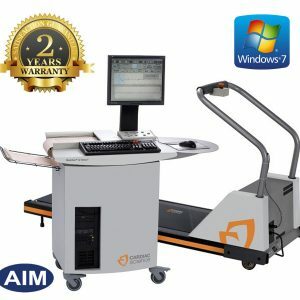 The simulated heart rate is adjustable to any value between 30 and 240 bpm, with a default value of 60 bpm. PVC complexes may be selected by the operator. QRS SYNC: TTL compatible QRS synchronization pulse ( mini-phone jack). The leading edge of the sync pulse is delayed 25 msec (nominal) form the ECG complex. 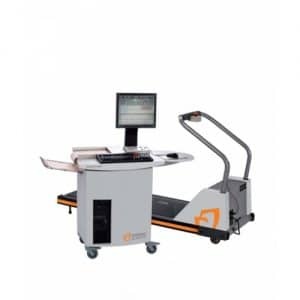 Analog Output Three-channel ECG or heart rate/treadmill speed (mph)/treadmill grade (%) (3 mini-phone jacks). 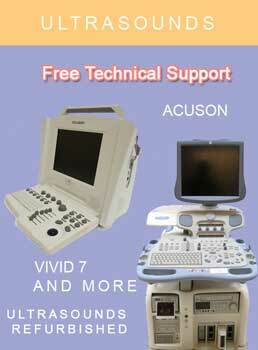 ECG signals are bipolar, ±5 volts, and the output signals have a gain of 1000 over the input signal. Signals are linear from 0 to +5 volts maximum. If the output is set to heart rate/speed/grade: 120 bpm= 1.0 volt; 5.0 mph = 1.0 volt; 10% grade = 1.0 volt.